The “Planet of the Apes” franchise has featured legendary composers and outstanding soundtracks going all the way back to Jerry Goldsmith’s avant-garde masterwork for the original in 1968. Few other franchises (perhaps even none outside of “Star Trek”) have showcased such a rich and diverse series of scores composed by such an array of talented composers. So when it came time to re-imagine and re-launch the film brand name with “Rise of the planet of the Apes” in 2011, director Rupert Wyatt and his composer of choice Patrick Doyle faced the daunting task of trying to create something musically fresh while standing in the shadows of composing giants such as Jerry Goldsmith, Leonard Rosenman, Lalo Schifrin, and Danny Elfman. Patrick Doyle had just finished up composing a majestic work of symphonic wonder for his longtime collaborator Kenneth Branagh on “Thor”, my choice for Best Original Score of 2011. 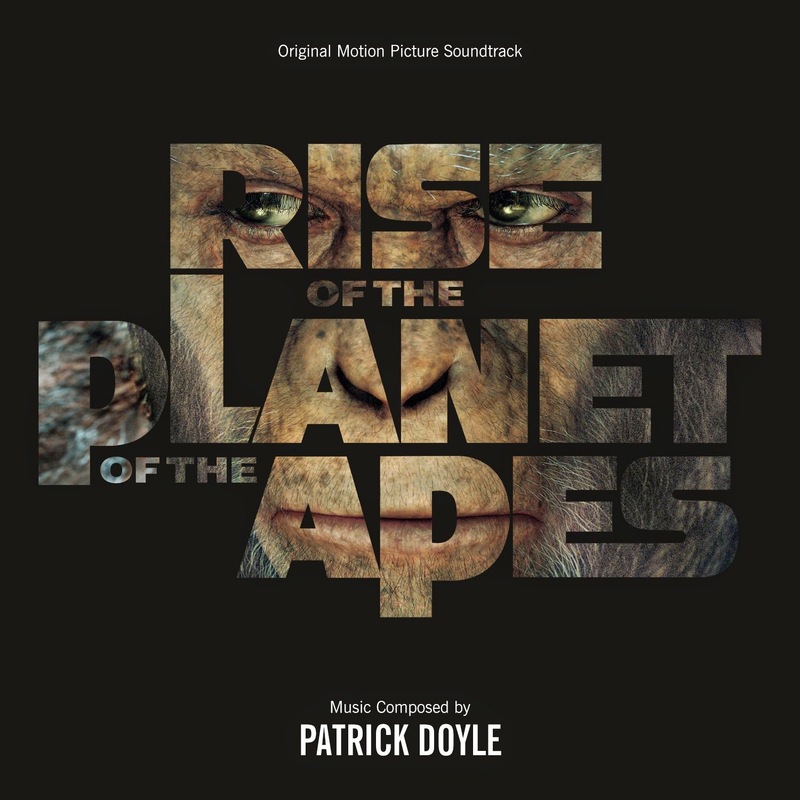 It was perfect creative timing for Doyle because he was able to carry that musical momentum over into “Rise of the Planet of the Apes” and created a rich, emotional tapestry of mystery, wonder, and sentiment—serving as the ideal synergistic score to accompany director Rupert Wyatt and screenwriters Rick Jaffa and Amanda Silver’s character driven, emotion-packed cinematic masterpiece. Doyle establishes a sense of mystery, awe, and danger right away in track one of the soundtrack album, “The Beginning”, and wisely chooses subtle African influences in his choice of instrumentation and the haunting pitch of the choir vocals. We also get a theme for Bright Eyes that morphs into a brief escalating crescendo that lays the ground work for the two main themes of the soundtrack, “Caesar’s Theme”, and “Muir Woods”. Like all great composers Doyle lays a musical framework early in the score as he establishes the themes and motifs he will build upon in later, more fully developed cues. The tension filled “Bright Eyes Escapes” builds into a rhythmic suspense cue before ending in a mournful vocal rendition of Bright Eyes Theme. “Lofty Swing” is a strong stand-alone cue with the best African flair of any track. “Stealing The 112” is a terrific suspense cue with a statement of the spooky “mystery” theme that has a James Newton Howard/”The Sixth Sense” vibe to it and is also featured prominently in “Who Am I” and “The Primate Facility”. “Muir Woods” is a majestic, soaring cue that together with the gorgeous, haunting, “Off You Go” give a bold, wondrous statement of Caesar’s Theme and form the heart and soul of the score. This is imaginative film scoring at its finest and reminiscent of the glory days of John Williams, Jerry Goldsmith, and James Horner. Patrick Doyle is not known as a composer of action music, and while he is no Goldsmith (or even Rosenman or Elfman in that regard), the action music in “Rise of the Planet of the Apes” is expertly crafted and beautifully arranged and orchestrated with strong clean lines and no numbing walls of sound. Doyle is a gifted, melodic composer and uses melody in his action music in a similar way that Bruce Broughton does. “Gen-Sys Freedom” and “Zoo Breakout” are exciting action cues and the outstanding “Buck Is Released” is a blast. But, as is the case with “Thor”, it is with the sentimental material where Doyle really hits out of the park. The last two cues pack an emotional wallop as Buck dies in Caesar’s arms in “Caesar And Buck”, and Will and Caesar share a bittersweet moment back in the magical Muir Woods of “Caesar’s Home”. The music during the final good-bye scene is absolutely magical; a deeply moving “E.T.”—esque scene that builds into a soaring statement of “Caesar’s Theme” that plays out over the final credits as the camera pans up to final shot of Caesar and his new family.